Eastern Tennessee and Western North Carolina can get pretty warm and muggy in mid-summer. Great Smoky Mountains National Park is not exempt from that. So when I hike in July and August I like to head for the high country… and there’s nowhere higher in the Smokies than Clingmans Dome. In fact, it’s the third highest peak in the East and the highest point along the full length of the Appalachian Trail. Taking the A.T. from Clingmans Dome to Newfound Gap on the North Carolina / Tennessee state line is a great workout through boreal forest of spruce and fir. Ken and I ventured to this lofty location on Monday, July 25, 2016 beginning at 9:00AM and ending about 3:15PM. Our plan was to take the Appalachian Trail from the summit of Clingmans Dome to Newfound Gap. What we didn’t plan was a torrential rain storm. Hike Rating: Difficult. Extremely strenuous. This one is hard folks. Hike Configuration: Point to point. Trail Condition: Fairly good. Beware of slick rocks and roots. Some overgrown areas. Starting Point: Parking area at the west end of Clingmans Dome Road. Trail Traffic: We encountered five other hikers during our 6 hour trip. 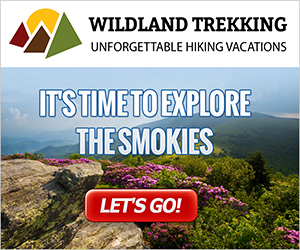 How to Get There: From either Cherokee, NC or Gatlinburg, TN take Newfound Gap Road to Clingmans Dome Road, then all the way to the western end. You must climb the paved trail to the summit of Clingmans Dome to find the Appalachian Trailhead on the left. If you’ve been hiking for decades as I have, you learn from experience that sometimes you have good hiking days, and sometimes you have bad hiking days. It’s an energy thing. Some days the climbs just seem harder and the muscles get tired faster. This was one of those days for me, and as a result, this hike turned out to be hard… very hard. Throw in an hour’s worth of downpour and I was ready to cry “uncle” by the finish. We stopped at Newfound Gap first to scope out the beautiful morning views before heading up Clingmans Dome Road to begin hiking. The roadway had the typical Smokies morning fog and mist wafting through the gaps and filling the valleys far below. There are few views in the Southern Appalachians as stunning as from Clingmans Dome — that is if the view isn’t totally obscured by fog. We were fortunate on this day as we appeared to be between two cloud layers. The grey layer above us, however, was an ominous portent. You get warmed up right away climbing the very steep half mile paved pathway from the parking area to the summit of Clingmans Dome. It’s nearly 300 feet straight up the mountainside. When you get near the top you will see the Appalachian Trail coming up from Mt. Buckley on the left. DON’T TAKE THIS TRAILHEAD! You want to continue all the way up, to the base of the observation tower where there is another A.T. trailhead on the left. It is also marked as the Mountains to Sea Trail. The woods that cover the slopes of Clingmans Dome are what is known as boreal forest or snow forest, a biome characterized by coniferous trees consisting mostly of pines, spruce and fir. Boreal forest is typically found in northern climes, like Canada or Russia, but, due to both elevation and ice ages, the mountain ranges of Southern Appalachia share many of the same traits. Unfortunately though, much like the hemlock infestation at lower elevations, the fir trees have been decimated by adelgid on the high ridges. The “grey ghosts” are quite evident on Clingmans Dome. Once on the Appalachian Trail you will come to a junction in just a couple hundred feet. For this hike, turn right, towards Mt. Collins shelter. As it does for its entire length through Great Smoky Mountains National Park, the A.T. straddles the Tennessee/NC state line. For the next two miles you will be heading steeply downhill through the boreal forest. Through much of the distance the trail is trench-like, from both overuse and erosion. The bed of the trench is filled with slate, making it not particularly comfortable on the feet. There are also many large boulders embedded within the trail that create large steps down, or up, as the case may be. Combine that with a typically moist surface because of the rainforest qualities and the slipping hazard is pronounced. It pays to take your time and insure your feet are firmly planted before taking your next step. Slate is a fine-grained, foliated, homogeneous metamorphic rock derived from an original shale-type sediment. It tends to crumble from the larger shale fins, then wash into the trail bed during rain storms. The first couple miles of this hike are on the opposite side of the Clingmans ridge from the Dome Road, so it is relatively quiet. You are more likely to hear songbirds and breeze rustling the tree canopy than you are motorcycles and diesel pickup trucks. That changes though as you approach Collins Gap where the trail crosses back over to the east side of the ridge and follows directly beside the road. What also happens at Collins Gap is that the downhill ends, and the uphill begins. Think of the trail like a rollercoaster, up and down, up and down. For the rest of the length, that is what it’s like. The 1.5-mile climb from Collins Gap up Mt. Collins is quite strenuous. It’s one of those that requires frequent breathers. I found myself wondering when the climb would ever be over. If you take a look at the elevation profile above, below the GPS track, you will see that it climbs from roughly 5,600 feet to nearly 6,200 feet on Mt. Collins. I have climbed many mountains that were longer and steeper, but this one really seemed to wear me out. Good days and bad days. There was one nice thing that helped pass the climb. Both turk’s cap and Carolina lilies were blooming along each side of the trail. These bright orange beauties are an annual sign that summer has arrived in the high country. The forest also changes somewhat. The trees are younger, and smaller, and more densely packed. Apparently 6,168′ Mt. Collins was more heavily logged in the early 20th century than was the Dome summit area. Soon after topping Mt. Collins you will approach a series of trail junctions. The first is with the Sugarlands Mountain Trail on the left and its path to Mt. Collins shelter. Soon after is the Fork Ridge Trail on the right. This is also where the Mountains to Sea Trail departs the Appalachian Trail. Beyond these two junctions, the A.T. once again hugs close to Clingmans Dome Road, so there are also occasional spur trails that enable you to end, or start your hike part way. At one of these openings I caught a brief view down the Deep Creek drainage and saw that there were some pretty ominous looking clouds hovering just above our level. It wasn’t supposed to rain until well into the afternoon, so I didn’t think much of it. Da-da-dumb. We came to a nice level place in a deep, dark forest with many logs alongside the trail that was just perfect for lunch. It was quiet. It was cool… and we had comfortable seats. It was nice to get the pack off. Ken’s wife had put together some homemade burritos for us that were scrumptious as well as re-energizing. This is where we rested while eating lunch. Fungus on the old logs and ferns along the trail side gave us plenty to study. The break, and the food, helped me recover some of my lost energy. We began another brief uphill stretch as we entered a protected beech forest. Apparently the National Park Service has encountered a problem with feral hogs here over the years, so they have surrounded a region of the woodland with a protective fence to keep the hogs from tearing up the beech habitat. As we topped the rise, we heard a different sound ahead of us and below… and it seemed to be moving up the hillside. We listened closely. We looked each other in the eye and said, “That sounds like rain.” It got closer. We dove into our packs for the rain gear. Then, WHOOM! It was on us. The two minute warning we were given to get out the rain gear didn’t make much of a difference. The rain was torrential. Within a matter of minutes the Appalachian Trail was a small creek with 2-3 inches of water running between its sidewalls. As we reached the next climb, the perspiration from the exertion and the humidity made me nearly as wet inside as outside my jacket. It was like a sauna suit. For the next hour we marched through the downpour, splashing in puddles, gingerly navigating the even more slick boulders and moss. Exposed roots were slick like a baby seal. We were fortunate that neither of us slipped and fell. The wetness now added even more weight to my already tired shoulders. By the way, thanks for allowing me to whine. I feel better now — but I didn’t then. I didn’t take any photos from mile 6 through mile 8 of this hike. My camera and lens are supposed to be waterproof, or at least water resistant, but this was one really, really hard rain. I chose not to chance it. 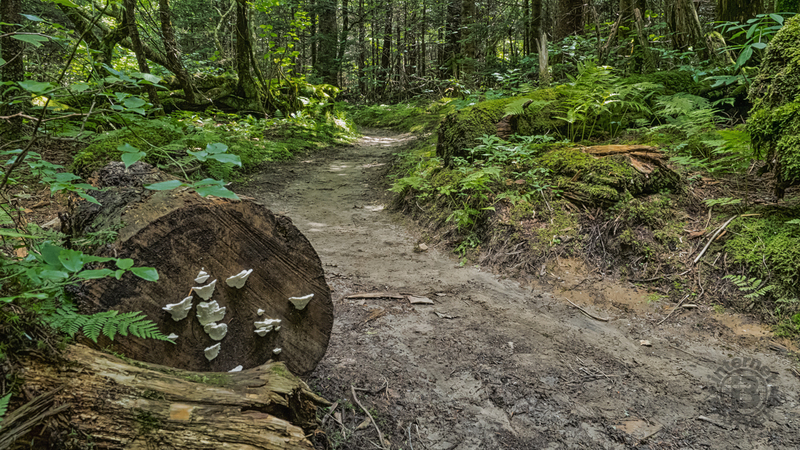 It was still raining when we reached the opening in the forest at the junction with Road Prong Trail. I debated in my mind about finishing the final mile and a half on Clingmans Dome Road, but convinced myself to cowboy up and stick to the trail. Wouldn’t you know that the trail immediately did another climb 200 feet above the road? There were two more descents and two more climbs before finally reaching Newfound Gap. About 20 minutes before we finished the rain finally abated. It was a relief to take the hood off and unzip the jacket to get some air. I managed to get a few pictures of the misty clouds lifting above the drainage. When we finally got to Newfound Gap there was actually blue sky. I had enough energy to take one last photo before collapsing on the stone wall from exhaustion. This hike, and the elements, whipped me. It was funny looking at the other folks looking at us. There were the usual hundred people milling about Newfound Gap, nearly all in clean and dry shorts and tees. We looked like drowned rats. Usually when I finish a hike, I ask myself if it was worth it. Invariably I conclude… absolutely! I love hiking. It is my passion. This time I had to think for a moment. But eventually I decided that yes, yes it was. There are a lot worse things in life than hiking in a rain storm in the breathtaking Smoky Mountains. Summarizing, you better put on your big boy and girl pants for this one. It is very strenuous, and rugged, even without an apocalyptic storm. 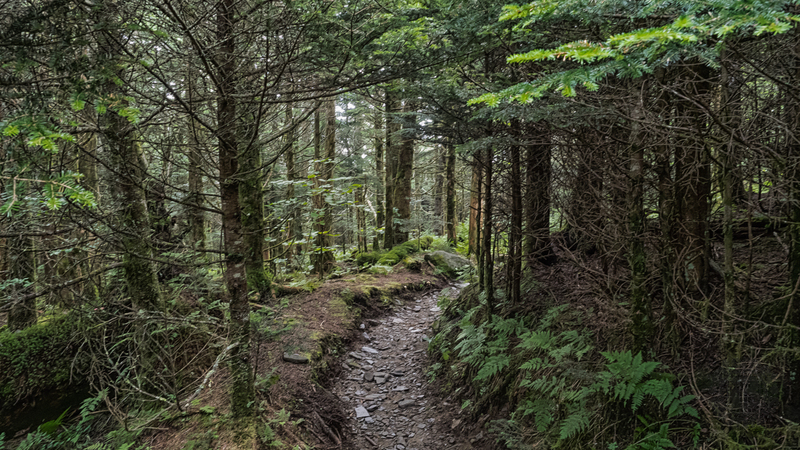 Be sure to get your fill of vista viewing from Newfound Gap and Clingmans Dome, because there isn’t much to see once you’re on the trail. This is a forest hike pure and simple. The forest is stunning of course. Between evergreen aromas and flourishing ferns and moss, what there is to see is right at your feet. Take your time so you don’t slip and fall, and also so you don’t burn out all your energy too soon. But even in the dog days of summer, the cool clean air in the high country can’t be beat.